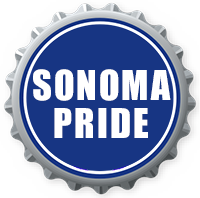 Sonoma Pride is a partnership between Russian River Brewing Company and King Ridge Foundation. In part, the Sonoma Pride Label is being released in effort to raise funds for victims of the catastrophic fire events that have taken place in Sonoma County, California in October of 2017. Sonoma Pride was originally conceptualized by Natalie and Vinnie Cilurzo from Russian River Brewing Company in July 2015 to celebrate the bounty and greatness of Sonoma County. Since that time, two beers (Amasa and Dauenhauer) have lived under the Sonoma Pride brand as an annual release at the Russian River Brewing Company brewpub. Under the dire circumstances Sonoma County is facing, Natalie and Vinnie have redirected the use of the Sonoma Pride name to help those in need after the tragic fires in Sonoma County. Instead of re-brewing Amasa and Dauenhauer (which have long production times) they are simply brewing a beer called Sonoma Pride to help those in need. King Ridge Foundation is a Santa Rosa based 501(c)3 non-profit that through Levi's GranFondo has raised more than $2.5million for charity since 2009. In 2015, King Ridge Foundation raised more than $60,000 for relief efforts in connection with the Valley Fire, one of California's most destructive wildfires in the state's history. King Ridge Foundation's mission is to give at-risk youth a chance. During times of heightened community needs, our mission expands to focus on enabling everyone to return normalcy to our community's way of living. Through this flexibility we are able to thrive, and continue to serve our core mission. Learn more about King Ridge Foundation at kingridgefoundation.org. King Ridge Foundation is a California 501(c)3 non-profit organization and your donation is 100% tax-deductible. Our tax ID is 27-0420906.